Best part: Gyllenhaal’s mesmerising turn. Worst part: The detective sub-plot. No, Hollywood’s latest attack against Western Civilization – scintillating crime-thriller Nightcrawler – isn’t an X-Men spin-off. Almost certainly, this crime-thriller won’t resonate with average film-goers. In fact, those waiting for said superhero flick may shrug it off. From its casting choices to its viewpoints,the movie rallies against everything comfortable and wholesome. However, in this business-over-artistic-value era, few movies pack the one-two punch of creativity and intelligence. Several recent movies have dissected capitalism, Western prowess, and modern media. Crime-dramas including Maps to the Stars and Gone Girl tear through the wool over our eyes. 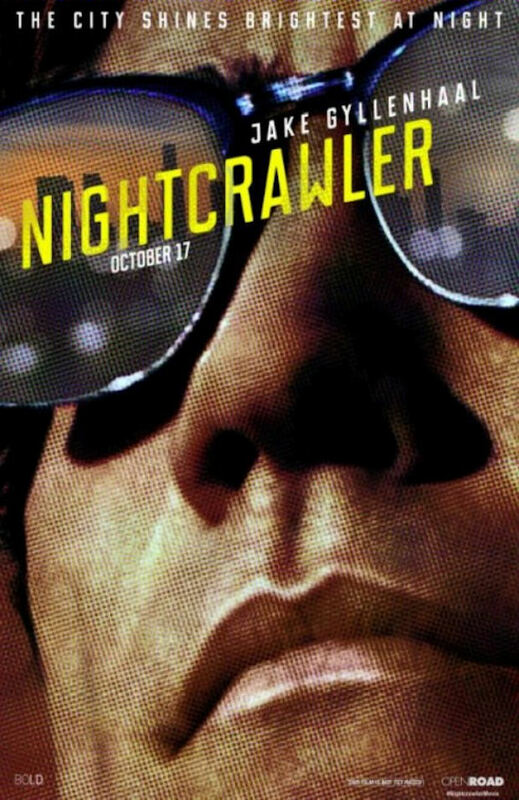 Nightcrawler seeks to uncover the lowest rung of humanity. However, from a production standpoint, it appears unaware of its own hypocrisy. Despite attacking media, culture, and society, Hollywood’s allure still shines through. The cast and crew live financially and culturally rich existences. What would they know about lower-class suffering? So, with such people leading the charge, how does Nightcrawler get away with it? By being accurate, determined, and so damn entertaining! The premise, though charging into several big questions and themes, revolves around one bizarre man. Louis Bloom (Jake Gyllenhaal) is an unemployed twenty/thirty-something with his eye on the prize. Desperate for cash, he resorts to stealing and trading metal from industrial complexes. Attacking and stealing from innocent people, his disturbing behaviour never pays off. One night, after pulling over to watch TV-news cameramen (nightcrawlers) film a fatal car crash, he concocts a get-rich-quick scheme. Obsessed with money, power, and respect, our unqualified and unstable lead becomes lost inside his uber-calculated conscience. Arming himself with a cheap camera, a police scanner, and unemployed sidekick Rick (Riz Ahmed), Bloom aims for industry success, adrenaline rushes, and recognition. Certainly, Nightcrawler is an ambitious and opinionated crime-thriller. Ambitiously, it strives for the action-thriller and Aaron Sorkin crowds. Tackling major endeavours within a taut 117-minute run-time, certain sequences eek under immense pressure. Rushing towards its resolution, the movie struggles to define its points. Delivering a crash course in 21st-century living, director Dan Gilroy – acclaimed filmmaker Tony Gilroy’s brother – throws everything at us. Obsessed with its snaky lead character, the movie’s ethical and emotional current crafts a punishing and relentless swell. Throughout the first half, this crime-drama seems intent on following Bloom’s rise to success. Examining its slimy go-getter lead, the opening scenes deliver several nasty surprises. Contrasting Bloom’s home and work life, it becomes a unique thesis on the American Dream. Watering his one plant before hitting the web, our near-nocturnal lead pours blood, sweat, and tears into his journey. As the second half rolls through, he transitions into a murderous, selfish psychopath. Post dynamic station manager Nina(Rene Russo)’s introduction, the movie becomes a schizophrenic struggle between right, wrong, and modern civilization. The narrative, examining what Network expounded upon decades earlier, obsesses over delivering harsh truths. “What if my problem wasn’t that I don’t understand people but that I don’t like them?” (Louis Bloom (Jake Gyllenhaal), Nightcrawler). 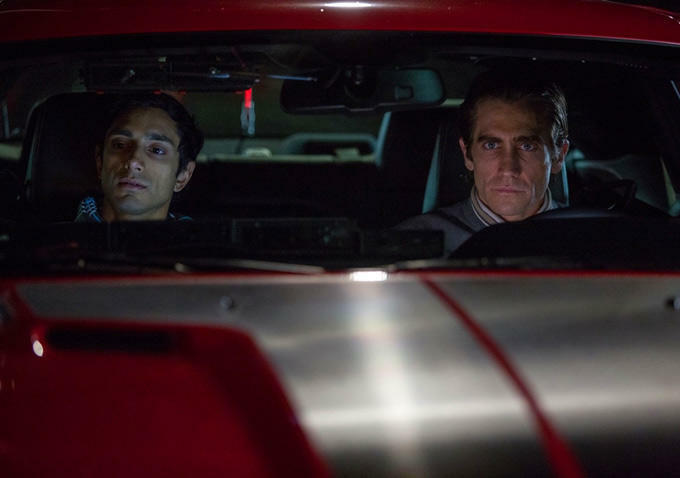 Nightcrawler‘s nihilism may repel some viewers. Set in one of America’s most violent cities, its anti-capitalism agenda unfolds spectacularly. Presenting a pro-TMZ/anti-ethics world, the movie worships this seedy underbelly of vile men and lifeless machines. Bewitching those around him, Bloom’s ultra-slick business speak describes everything about him. Like a self-help speech, he communicates in lists, statistics, jargon, and tiresome cliches. His actions, proving pictures speak louder than words or morals, discusses this era of citizen journalism, the cameras-on-everything craze, and matter-over-mind media. Feeding TV stations with graphic images and exclusive/first-on-the-scene accounts, there is nothing he can’t, or won’t, do. Credit belongs to Gyllenhaal’s complete career-180. Following up star-defining vehicles Prisoners and Enemy, his Oscar-worthy turn tests each tick and inflection. Russo, fresh off a long-term screen hiatus, excels as Bloom’s shadowy game’s central victim. Gracefully, Ahmed and Bill Paxton provide chuckles as Bloom’s personality-driven distractions. Gilroy, like our lead character, creates show-stopping, unshakeable thrills. Several set pieces – depicting everything from shootouts to car accidents to home invasions – deliver edge-of-your-seat fragments throughout. The car chase, set up by our icky ‘protagonist’, boosts the scintillating and gruelling last third. Bolstered by Bloom’s Mustang, this sequence distinguishes itself from everything else. In Nightcrawler, the City of Angels plays host to spiritual, emotional, and psychological demons. As Bloom crawls under our skin, the drama accelerates whenever he’s on-screen. Chronicling a slick rise-and-rise-and-rise story, this pulsating crime-thriller revs with force, meaning, and consistency. Similarly to Collateral and Drive, LA becomes a mix of crime, grime, and slime. Despite the sickening blackness, the grey areas keep the reviews flowing and ratings soaring. Verdict: A zany and zippy Oscar hopeful.